Mystique Jewelry can be worn and enjoyed just as you would any fine piece of diamond jewelry. Cleaning your jewelry is extremely important in order to maintain the original brilliance and luster. We give a lifetime guarantee that our stones will never get cloudy or change color. If your stones look cloudy or you feel you jewelry has lost its luster, then your jewelry needs a thorough cleaning. Regularly cleaning your jewelry will remove the everyday substances and liquids that your jewelry is exposed to during normal wear. Exposure to these substances can considerably reduce the brilliance of the stones and the gleam of the precious metals. Regularly cleaning your jewelry will remove these everyday substances that your jewelry is exposed to on a daily basis. Remember to clean your jewelry as needed. If you wear your jewelry every day, you may need to clean it every day or every few days. It is good to get in the habit of cleaning your precious items. You can tell if your jewelry needs cleaning by looking at it. If it doesn't sparkle, it needs cleaned! 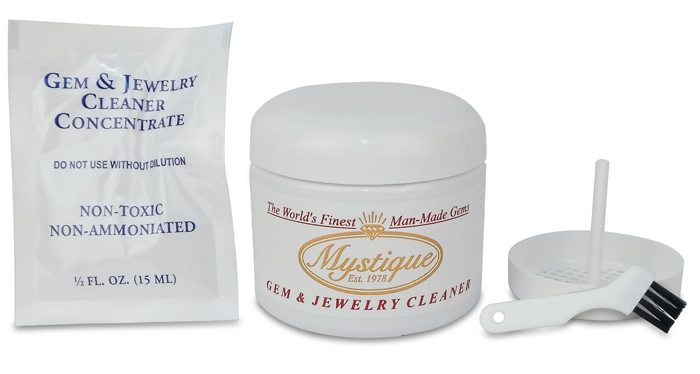 You can use the Mystique Gem Jewelry Cleaner Starter Kit you received at the time of purchase, or any fine jewelry cleaner. Ultrasonic cleaners may also be used, however it can loosen stones and not recommended for pave set jewelry. Since store-brought cleaners do not retain their effectiveness for very long, we actually recommend using a fresh homemade solution of clear ammonia and water (1/2 ammonia, 1/2 water). Soak your jewelry in the cleaning solution for 2 to 5 minutes. Rinse jewelry in a bowl or cup of hot tap water (if you rinse in the sink make sure you close the drain first). Remove and pat dry with a soft cloth, or dry with hair dryer (low setting). Jewelry should be clean and dry before storing away. Chlorine can be harmful to precious metals and all gems including diamonds. Chlorine in swimming pools, hot tubs, or chlorine cleaning products should be avoided when wearing fine jewelry. Mystique will be happy to professionally clean and polish your jewelry at no charge upon request (shipping charges not included). As always, please call us at 800-778-0080 if you have any questions or concerns.